Comet PAN-STARRS March 2013, a photo by ijerry1 on Flickr. 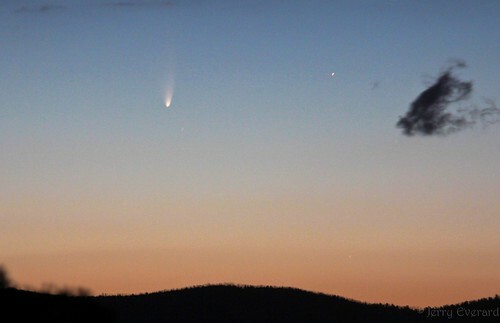 This photo of comet PAN-STARRS was taken on 8 March. The comet was named for the PAN-STARRS observatory array in Hawaii where it was discovered as c/2011/L4. It took a couple of days trying, but I got there. And here’s how: I went up to Mt Stromlo armed with binoculars – about half an hour before sunset. This way I could set up in daylight, pre-focus the lens on a distant horizon and then wait for the comet to appear. The setup was a canon 60D with a 100-400mm f/4.5-5.6 canon zoom lens, mounted on a tripod, with a remote release. I used mirror lockup to reduce vibration to a minimum – and turned off the image stabilisation. You see, the thing is, that if the camera is mounted solidly on a tripod, then the image stabilising gyro will actually introduce vibration – so turn it off if you’re using a tripod. I scanned the sky about a hand span above the horizon after the sun set. Towards the end of twilight I was rewarded with the sight of a faint light smudge – which in binoculars resolved into the definite comet shape you see here. I used a 4-second exposure at f5.6 on ISO400 and a zoom of 275mm – so you could get the same photo with a 300mm kit lens. You could also get a pretty good image with a 200mm lens. supermoon May 2012, a set on Flickr. With the moon presenting its closest approach this year coinciding with the full moon I couldn’t resist heading up to Mt Stromlo – next to the observatory – in Canberra Australia. Sure enough it arrived on time at about 5.14pm. Where to look? I used the compas app on the phone to identify where the moon would rise, and got into position a few minutes before moonrise. Most images were taken through a 300mm zoom on a canon 60D DSLR. It was tripod mounted and I used a remote trigger. A little fill light and sharpening in Adobe Lightroom completed the pictures. _MG_8219, a photo by ijerry1 on Flickr. The subject of this photo may look like a modern take on a fortress but this is a musical instrument – one of the few full chromatic carillions – a computerised bell suite that can play tunes – often ringing out over Lake Burley-Griffin. 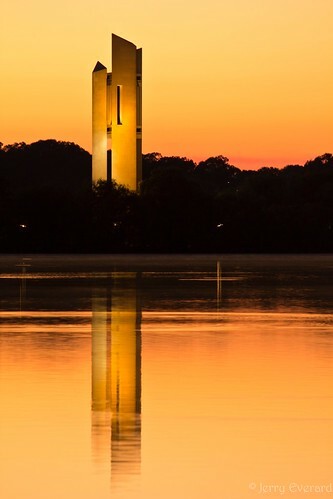 Seen at dawn – the tower was bathed in a golden light. I positioned it on the third, and decided to include its reflection in the still lake to provide a point of interest. The image was captured on a canon 60D at 1/6th of a second. ISO200 200mm/f4.5. Camera was tripod mounted and I used a remote trigger and live-view mode to reduce vibration. I then imported the image into Adobe lightroom where I gave it just a tiny bit of sharpening before exporting to jpeg and uploaded via iPhoto. steampunk goggles, a set on Flickr. I’ve always liked the steampunk style – so I thought it was time to add some functional goggles with flip-down magnifiers. I’m happy to share a step-by-step how-to, but a lot will be self-explanatory. Essentially they are welding goggles. I removed the ventilators and lens holders and sprayed the bright yellow shades black. Then I removed the lenses from the holders and sprayed the holders and ventilators with an old-gold paint. Finally I bought a couple of cheapo plastic magnifiers that were about the right diameter and replaced the dark welding shades with the magnifiers, after cutting off the handles – these were glued in place and when the paint had dried I reassembled the whole thing, and this is the result. I was quite pleased with the result! Folding bike, a set on Flickr. At $149 I figured it was worth the experiment from Aldi. The Crane folding bike comes with guards, bell, rack, and prop-stand fitted, and a bag so you’d have to wonder how much bike you get – well as it turns out, not too bad. It is basic – no springs and no handlebar height adjustment [ED: Actually, thanks to Tom M’s comment below, you CAN adjust the handlebar height by opening the handlebar hinge, and loosening the allen head bolt that is revealed underneath, lifting the handlebar stem and re-tightening the allen head bolt]. But the frame is solid and the 6 speed shimano gears are positive and the bike tracks well. While rated to riders up to 105kg I reckon it would happily take someone up to 120kg without any worries. Seat height adjustment is very impressive, and even a tall person should be okay once the handlebar height is adjusted (see edit above). The spring latches work well, and the quick release toggles hold everything solidly. It’s not the lightest bike around at 18kgs but it’s not meant to be a race bike, or an off-roader – indeed without springs you probably wouldn’t want to take it too far off a sealed surface. From bag to bike it takes me about 30-40 seconds to ride away, but with practice I can probably get that down to around 15 seconds. Great manual and the supplied tools – double spanner and an allen wrench – are well made. The only tool they didn’t supply was a small allen key to adjust the position of the gear change on the handlebar to enable me to adjust the brake lever position – but I had that in my own tools anyhow. The fold is quite impressive – lower the seat post, hinge the handlebar stalk, then main frame and then the two pedals. There is a tie-strap to keep it together for putting in the bag. Overall ride impression, firm, taut and fit for purpose – folded into its bag I reckon I’d get two in the car boot without putting any of the seats down.